Buy Circulator Pumps Direct and Save! Circulator pumps are designed to move a fluid within a closed circuit. In home or building water systems, circulator pumps are typically used to ensure that warm water remains moving through the piping so that it will be immediately available at the tap (as opposed to waiting for cold water to heat up). Circulator pumps can provide a way to save on energy costs. 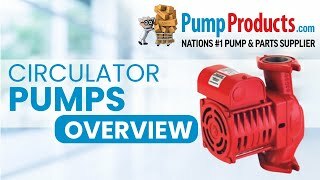 PumpProducts.com carries a variety of circulator pump types, such as in-line, single stage and solar circulators from a variety of top manufacturers like Armstrong, Grundfos and Taco. Accessory controls are also available.